There is an Italian restaurant near my house that I frequent when I am looking for a no frills carb fest. The atmosphere is not great and the décor definitely leaves something to be desired, but the food is outstanding - great pasta dishes with rich, sometimes creamy sauces and gargantuan portions. They fit so much pasta on one plate that two maybe three people could share just one dish. This past weekend I started craving a no frills carb fest about halfway through a seven-mile death march, I mean really lovely hike through the Santa Monica Mountains. Truth be told it was a lovely hike, but one that left all three hikers absolutely famished. Immediately after we returned home we headed off to gorge ourselves on carbs to refuel our bodies. Starving and unable to agree on dishes to share, we each ordered our own. Not surprisingly, this left us with three to-go boxes, enough for at least another meal per person. The next day, determined not to let all those leftovers go to waste, I threw a half pound of leftover pasta with marinara sauce into a frying pan with eggs and cheese and made myself a pasta frittata. Frittatas are always a great way to clean out the veg bin and use up leftover ingredients, but this pasta frittata is now by far my favorite. The pasta gives it a heartiness that just isn’t present when a frittata is eggs and veg alone, and if you love the sauce your favorite Italian restaurant uses on your pasta, why not give it a second chance to shine? I’ll be heading back for more carbs shortly, and I will be denying any requests to share. From now on, I’ll be making sure we come home with leftovers. Note - Any frittata recipe should be thought of more as a guide then a strict set of rules. The whole idea is to use up what you have on hand. No parsley? Try any number of fresh herbs, decreasing the amount you use depending on how pungent the herb. No crème fraiche? How about goat cheese or sour cream? You get the idea. Throw in what looks and sounds delicious and it will turn out well. Preheat the broiler. Place the pasta in medium sauté pan over medium heat and warm through. In a separate bowl, whisk the eggs and parsley until combined and season with salt and pepper. Drop mounds of crème fraiche into the egg mixture, but do not combine. Pour the egg mixture over the pasta in the pan and cook until almost set, about six to eight minutes. 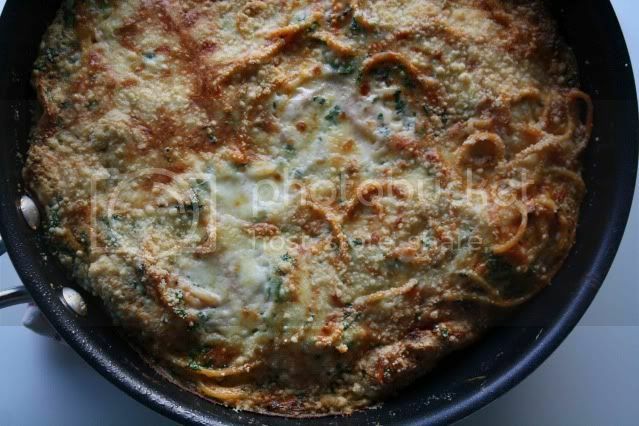 Sprinkle the grated parmesan on top and place the pan under the broiler until the frittata is set and starting to brown on top. Serve with a side salad for a delicious little meal. That looks yummy with all that cheese! And very satisfying I imagine after a long hike. This pasta has no evidence of leftovers. It looks delicious! I'm definitely a frittata fan, especially when it's time to clean out the fridge, but I've never tried PASTA frittata. Yum. Now I'm going to have to. Looks a bit like the spaghetti bake I used to make in college, although I never thought to make it using leftovers. Great idea! So funny-this is exactly what I made during day 2 of "weekend home alone"-so delicious. my favorite way to make a frittata. This looks gorgeous. I'm thinking leftover pesto pasta might be especially nice. I'm never too sure what to do with leftover pasta, but this looks like a great way of using it! Totally delicious and cannot wait to try it out. Oh yeah, you definitely need carbs after a death march like that one! Great idea for leftover spaghetti, which usually just sits in a pan staring at me after dinner. Something not quite right about reheating it but turning it into a frittata with eggs and more cheese is a super idea! You are a genius. I would have never thought of this! Huh, never would've thought of that one. Great looking fritata. 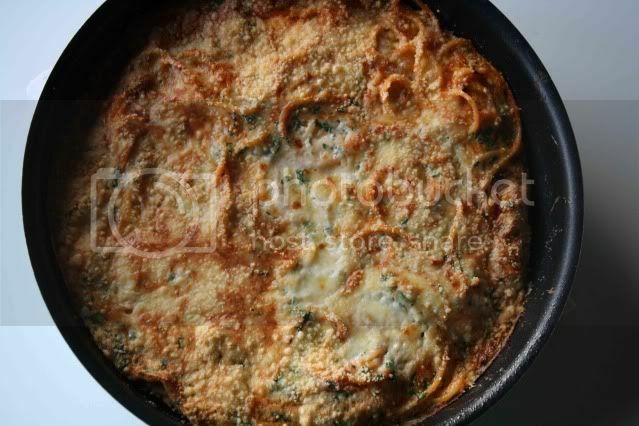 Okay, so I'm a huge frittata fan, and always have leftover pasta in the fridge, so why did this never cross my mind? Brilliant! What a great idea to use up leftover pasta!! Can't wait to try it next time we have leftovers. Your pictures of this are so wonderful. They make me want to ditch the chili I have on the stove and make some pasta just so I can have some leftovers so I can make this. I've heard of doing this before, or something similar, and It looks delicious. I make frittata *all* the time, so how is it that I never thought to use pasta and sauce?!?! This looks amazing... GREAT dish! What a good idea and something a bit different. Clever! wow that looks very tempting!!! Your dish really looks delicious. Aaahhh, the 7 mile death march, with snow on the trails here in Colorado, I have a good excuse not to take one but your right, it does give you a good excuse to eat big carbs. I really miss pasta. This looks so delicious. What a great way to use up leftover pasta! What a great idea. I love frittatas, but never thought to use pasta. That frittata looks fabulous - cheesy, melty and delicious! Your blog makes me really hungry - I need to have a snack before I read it. Thanks for sharing!